Director: Samuel Maoz. Cast: Yoav Donat, Oshri Cohen, Itay Tiran, Michael Moshonov, Zohar Strauss, Dudu Tassa, Reymonde Amsellem, Ashraf Barhom. Screenplay: Samuel Maoz. Twitter Capsule: The clanging panic and suffocation are gripping, but the dramatic structure and photography seem off. Still, strong stuff. In ways that would be hard to miss, Samuel Maoz's Lebanon is characterized by an unusual directness, even setting aside the strenuously publicized fact that it's a barely embellished reenactment of the writer-director's own experiences as an Israeli soldier during his country's invasion of Lebanon in 1982. 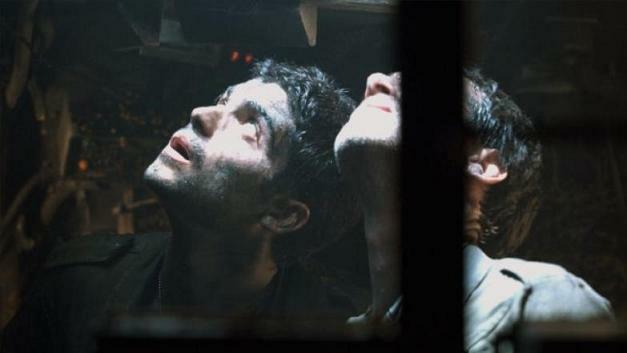 The film confines itself almost entirely within the claustrophic space of a rattling tank, as four under-prepared crew members attempt to fulfill a dangerous mission that they don't fully understand, and which may or may not have run off the tactical rails without anyone telling them. Occasionally, Lebanon breaks out of the spatial confines of the tank's interior, but if anything these shots are even more confining, since they're sunk within the visual POV of the gun operator Shmulik (Yoav Donat, the clear stand-in for Maoz). The crosshairs dividing the shot into quadrants and the repeated, arguably unnecessary inserts of Shmulik's outraged eyes in extreme close-up never let us forget that we're seeing what he's seeing, defined by a strange duality of passivity (in visual vantage, in vulnerability to attack) and of vertiginous agency (since those crosshairs remind us of the heavy artillery he could fire off at any moment, at anything he sees). I found the sonic motifs associated with Shmulik's gun-sights even more unnerving. Every time he pans or adjusts the angle even slightly, you hear a rude electronic whir that sounds like the microfiche viewer your public library is desperate to replace. After a particularly heavy assault on the tank, the sound gets worse, like the outboard motor of an already-crashed boat, and the visual lens gets cracked. To ferret out his enemies, to deduce his own purpose, or simply to ascertain his whereabouts, Shmulik is forced repeatedly to summon these visual and audio proofs of his rickety equipment, and thus of his precarious grip on life. In these and other respects, Lebanon is indeed a harrowing and, more to the point, a seemingly unmediated experience of the soldiers' terror. Believe all the reviews that urge you to go see it, and to admire the simplicity as well as the power of Maoz's conception. At the same time, though, and rather less to the movie's credit, Lebanon traffics in a near-opposite of immediacy. Virtually everything in the filmvisually, verbally, in terms of character typologieshas a conspicuous sheen of rhetoric. They make a point about the filmmaking, sometimes obtrusively so, rather than just being the filmmaking. The shots through Shmulik's periscope make it impossible for even the least critical audience member not to think about how Maoz has orchestrated his shots. The residents of the tankan ineffectual leader, an irritated second-in-command, a gruff higher-up, a silent prisoner who may or may not be a guilty party, a panicked weeper who pulls things together, a proficient soldier who breaks down into hysterical sobsare all archetypes rather than nuanced characters, and the blustery, high-pitched actors present them as such. The tank itself is both a marvel of production design and a somewhat pushy author of its own press notes, begging us to remark how this leaky, greasy, gristle-covered war-machine looks like the humid, dripping pancreas of some sweaty beast. The single female presence in the movie carries a lot of weight for that very reason and makes her own, would-be Sophoclean bids for allegorical weight. Shmulik gets a long monologue about a loaded and embarrassing personal memory that is triply rhetorical: it's clearly here to "humanize" the character, it gives the actor something showboaty to sell besides Shmulik's completely understandable terror, and it practically has a framed reproduction of Robert Shaw's U.S.S. Indianapolis speech from Jaws hanging over the scene, not because it's at all the same kind of memory but because the device of puncturing a high-tension thriller with a long, seemingly incongruous monologue didn't come from nowhere. The last shot of the movie is precisely the one you'd expect once you've cottoned to Maoz's sense of dramaturgy. It makes a strong point about war, if rather a blunt one; if anything, the core content of the shot is its own intention to make a point. Jaws or no Jaws, for all of Lebanon's understandably touted "immersive" qualities, its metacritical self-awareness reaches nearly Blue Velvet proportions: it simply isn't capable of lettings its sounds and images speak for themselves without implicitly commenting on them, exposing them as symbolic figures, engineering them into very heightened and specific effects, and virtually guaranteeing that the audience will receive them in a certain way, even if different viewers will react in different ideological registers to the formal and aesthetic prompts that Maoz has fashioned for them. In this way, Maoz's determinism feels worlds away from Ari Folman's diaphanous plunges into debatable memory in Waltz with Bashir, for which Folman himself seems barely to have settled on an interpretation, much less has he settled on one for us. This isn't to deny that Lebanon has real potency as an audio-visual experience and as an effective illustration of the barbarically impossible choices that a combat soldier is forced to makealthough here, too, you can imagine the Template Box in Maoz's screenwriting blueprint that says "Insert a scene HERE about impossible choices confronting the combat soldier." I chafed a little at Maoz's officious stewardship of my responses, and I fully expect that some of the same critics who cry foul when Steven Spielberg goads them into a tear will revere Maoz for following recipes and pre-determining our respones even more dictatorially. But the point should be emphasized: not all films that attempt to govern their audiences so strictly, or so overtly advertise their own architectures of form and theme, have nearly the punch that Lebanon does. Some of my favorite details were the ones that had least to do with the movie's rhetorical upshots. Twice Maoz finds under-exploited potentials in the familiar device of green-filtered night-vision, once by applying that creepy aesthetic to as innocuous an object as a field of sunflowers, and once by blurring and jostling the images beyond all recognition, as the tank speeds and rattles away from one catastrophe and into a likely sequel. Ashraf Barhom, so wonderful a few years ago as a Saudi in The Kingdom, literally drops in for one indelible scene as a phalangist who professes to be helping the Israeli tank crew but seems sinister and untrustworthy even before he goes abruptly speeding off in his Mercedes. The sound designers and editors deserve Oscar nominations that they're certain not to get, although I was much less taken with the photography of Giora Bejach, which sometimes fails to disguise that the tank he is filming has (inevitably) a much less restrictive interior than the tank we're meant to imagine. Bejach's lighting (and I'm worried about how you actually pronounce "Bejach") sometimes has the hard, blunt look of 300, and at other times the vapory macabre of Martin Sheen bobbing up from the obsidian river in Apocalypse Now, and at still other times the dusty griminess of more typical you-are-there realism. Unfortunately, this range of approaches feels indecisive to me instead of intriguingly varied. Everyone is calling attention to the "formalism" of this movie because its point-of-view shots are so conspicuous and the visual and sonic motifs are so repetitive. I'm not sure these elements make Lebanon any more formalist than all the superimposed sheets of memory in Waltz with Bashir or the constant tension between deep shadow and bright, elegiac lighting and John Ford silhouetting in Beaufort, unless we're being very reductive about what we mean by "formalism." Still, each film on its own terms, and particularly the trio as a set, furnishes valuable talking-points for how war takes shape in cinema, how this particular war has been experienced, commemorated, and dramatized, and how war and memory interrelate on screen. Lebanon's reception across nations and generations and its case history of being rejected by two of the top three competition-based film festivals (Cannes and Berlin) and crowned with top prize at the third (Venice) are as ripe for inquiry as the filmmaking itself, which is conceptually interesting even when it's aesthetically crudeand sometimes when it is crude, the crudeness is powerful and eloquent. A lot of audiences will respond to this film, and the reactions it engenders, aesthetic and political, are bound to be complex and revealing.